Malice defeated, or, A brief relation of the accusation and deliverance of Elizabeth Cellier wherein her proceedings both before and during her confinement are particularly related and the Mystery of the meal-tub fully discovered : together with an abstract of her arraignment and tryal, written by her self, for the satisfaction of all lovers of undisguised truth. 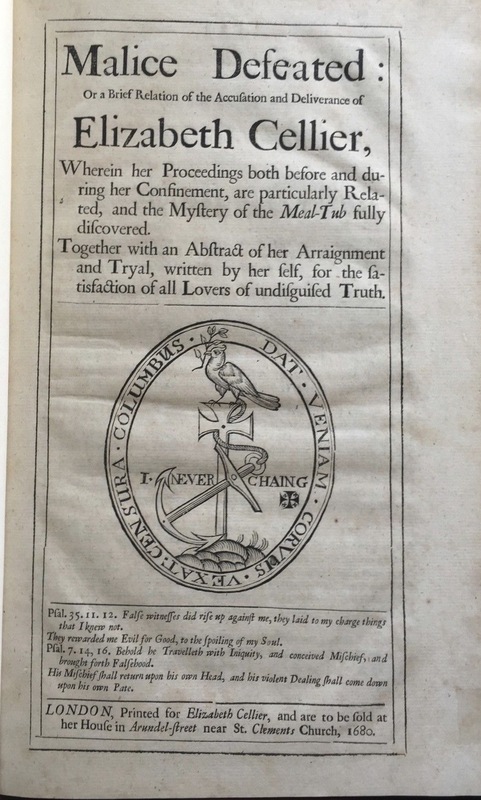 Includes “The matchless picaro” (caption title), two leaves at end (quire N), which was also published separately in the same year as “The matchless rogue” (Wing C1662). Folio A-l2,[Inserted after p. 42 (L2) is a leaf (¹M1) containing “A postscript to the impartial readers,” dated 21 Aug. 1680, and signed: Elizabeth Cellier.] , M2 (m2 is the begining of Wing C-1663) First edition. Disbound, with generally clean, well margined leaves, though cutting into some marginal notation a bit, with some small stains on the title, some faint marginal toning. “Popish Midwife”Cellier, who was know as the “Popish Midwife” first came into prominence through the pretended “Meal-Tub Plot” of 1680. Nothing seems known of her life till her marriage with Peter Cellier, a Frenchman, and her conversion from Anglicanism. In 1678 the prisons were filled with Catholics in consequence of the national alarm caused by the fabricated plots of Titus Oates. Mrs. Cellier’s charity led her to visit and relieve these prisoners, and as her profession procured for her the acquaintance of many leading Catholic ladies, she often became the channel of their charity towards the prisoners. Among these ladies was the Countess of Powis, whose kindness was shown to, among others, a clever impostor, Thomas Dangerfield. Becoming aware of this man’s true character, Lady Powis ceased to assist him further, and he, in revenge, decided to denounce her to the Government as concerned in a new popish plot. His story was that he had been released from prison through the good offices of Lady Powis and Mrs. Cellier, on condition that he would assassinate the king, Lord Shaftesbury, and others. He further pretended that he was to be engaged in manufacturing false plots to be foisted on those who were known to be unfavorable to the Catholic cause. One of these shams was to be based on a document which, he alleged, was hidden in a meal-tub in Mrs. Cellier’s house. Search was made, and in a meal-tub the paper in question was found. This document charged with treason most of the leading Protestants, including the king’s natural son, the Duke of Monmouth, the Earl of Shaftesbury, and Sir Thomas Waller, who was the very official who conducted the search. In consequence of Dangerfield’s accusation founded on this document, Lady Powis and Mrs. Cellier were arrested, as well as some other Catholics, among them the Earl of Castlemain. 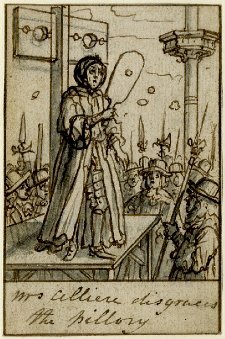 Mrs. Cellier’s trial took place on 11 June, 1680. She was charged with high treason, but practically the only evidence against her was that of Dangerfield himself, and she had little difficulty in proving him a witness entirely unworthy of credence. She was found not guilty, and Dangerfield himself was arrested on account of a felony, for which he had been previously outlawed. After her acquittal she published a this brief relation of the whole affair, under the title of “Malice Defeated”. This led not only to a long series of pamphlets for and against her, but also to her second prosecution. The charge this time was that of libel against the King and ministry, because she alleged that two witnesses in the Edmundbury Godfrey case had been tortured. But the real object of this prosecution, according to Roger North, was to prevent her from giving evidence in favor of the imprisoned Catholic peers. For this she was sentenced to pay a fine of £1,000 and to stand three times in the pillory. During the reign of James II she planned the foundation of a corporation of skilled midwives and a foundling hospital. It is stated that she is buried in Great Missenden Church, Buckinghamshire. She wrote: (1) “Malice Defeated; or a brief relation of the Accusation and Deliverance of Elizabeth Cellier” (London, 1680); (2) “A scheme for the Foundation of a Royal Hospital and raising a revenue of £5000 or £6000 a year by and for the maintenance of a Corporation of skillful midwives” (London, 1687), printed in the “Harleian Miscellany” (IV, 142) and in the “Somers Tracts” (II, 243); (3) “To Dr. ______, An answer to his Queries concerning the College of Midwives” (London, 1687-88). This book was burnt by the authorities after Cellier was found guilty.